With its high-resolution 10.1” diagonal wide-view LED-backlit display, Toshiba’s Thrive™ Tablet is well-sized for surfing the Web, movies, playing games, reading books and more. Engineered with our exclusive adaptive display technology; this screen adjusts brightness and contrast to the surrounding light conditions. You don’t have to squint to see the sheer versatility of this screen. Get ready for the fastest, most visually-rich tablet experience you can get. This tablet is built around the world’s first mobile super-chip, NVIDIA® Tegra™ 2. So you’ll enjoy extreme multitasking with the first mobile dual-core processor, the best Web experience with faster browsing, hardware-accelerated Adobe® Flash®, and console-quality gaming and higher-definition video with an NVIDIA® GeForce® GPU. This slip-resistant, rubberized surface is comfortable to hold, so you’ll never miss a beat when chatting or emailing on the run. 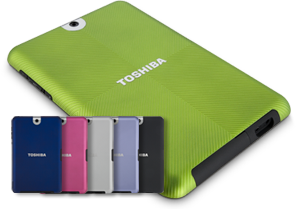 It’s also available six vibrant colors (colored back covers sold separately), making it easy to personalize the look of your tablet. Plus, it comes with a user replaceable battery to keep you going longer. Just because this tablet is small doesn’t mean it can’t reach mighty far, thanks to an array of the kinds of full-size ports you know and love. Swap pictures and files or expand your storage capabilities using the SD card slot. Plug into mini-USB and full-size USB 2.0 ports to share content with your other devices. And tap the full-size HDMI® port to see multimedia on a bigscreen TV. Forget about wimpy Web. Thanks to hardware-accelerated Adobe® Flash®, Toshiba’s Thrive™ Tablet delivers a complete Internet experience to help you explore, discover and interact. You’ll experience more satisfying social networking, games, streaming video and more―with all the animations you deserve. 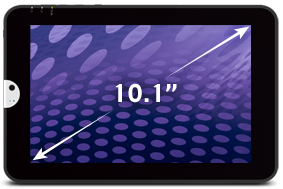 The Thrive™ Tablet is founded on the tablet-optimized Android 3.1 Honeycomb platform, designed from the ground up to improve your experience with devices just like it. In addition you’ll get full access to Google™ Mobile Services, Android Market™ Apps, customization tools and more. This tablet quite simply delivers everything. This tablet PC knows where it is, and what’s up, thanks to a suite of sensors including a gyroscope, accelerometer, e- compass and GPS. Tilt it into a portrait or landscape format—through a full 360 degrees of rotation. Experience a whole new way to play games. Note your location most anywhere on Earth. Plus, take advantage of today’s popular map applications, photo tagging and more.